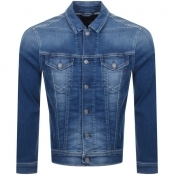 Designer Denim Jackets From The Biggest Brands. Upgrade your casual wear with the addition of a classic denim jacket. From timeless biker styles to stonewashed cuts with versatile detailing.